A year full of action. Our efforts in 2018 brought several results for sea turtles and their habitats. Here is a presentation with a few words and numbers. About 510 full-time volunteers participated in conservation actions on the field and 25 of them took up duties of field leaders. 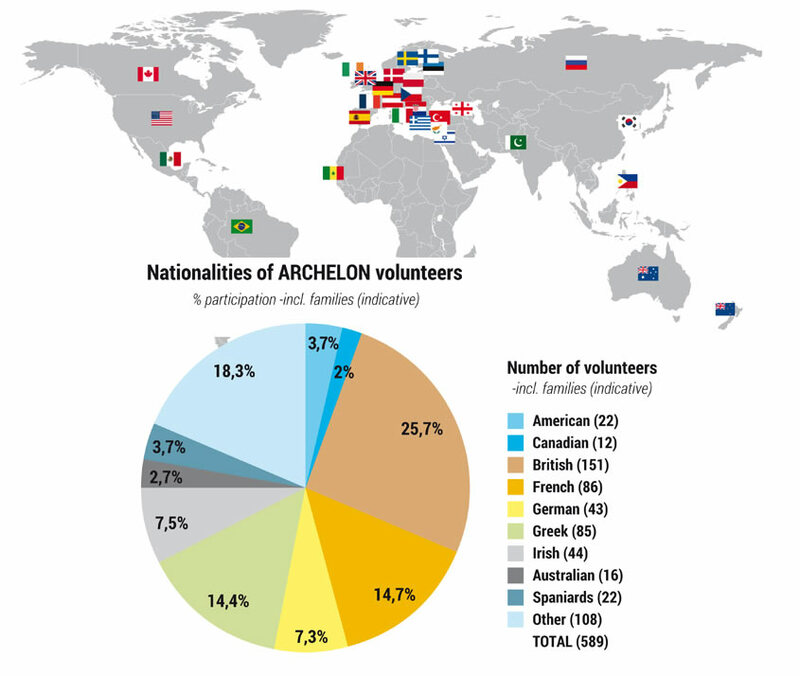 About 14% of these volunteers came from Greece. About 114 volunteers supported the operations of the Rescue network, the care and rehabilitation of injured and sick turtles and environmental awareness at the Rescue center throughout the year. Out of these, 50 were part time volunteers resident s of Athens greater area and 64 were full time volunteers from different countries. The selection and training of field leaders and the rest of the volunteers in sea turtle monitoring, conservation, rescue, care and rehabilitation, communication and fund raising has been a year round activity of ARCHELON. More than 70 internships from 25 educational institutions were accepted in the 2018 projects. Administration, management and coordination duties were performed by 15 members of staff, while about 15 people - ARCHELON members- offered their expertise and voluntary services as members of the Board of Directors, the different Committees and Working groups. Approximately 6000 nests of loggerhead turtles were recorded in the 134 km of coastline surveyed. Protection measures under specific scientific protocols were implemented for almost 65% of them. Approximately 400.000 hatchlings reached the sea from the areas surveyed in 2018 and about 75% of them were enabled to do so by the implementation of protection measures with the help of the volunteers. About 470 adult loggerhead females were tagged or found tagged during ARCHERLON’s night surveys on nesting beaches. About 240 sea turtles were tagged for the first time in the Amvrakikos feeding grounds. The total number of turtles taken care of at the Rescue Center was 87, out of which 20 had arrived in previous years. There were 67 new arrivals in 2018: 30 turtles were rehabilitated and returned back to the sea, 30 turtles died unfortunately and 26 remain under treatment. The recording of sea turtle strandings continued at a national scale, in collaboration with the Coastal Guard and other environmental organizations. Monitoring of threats at sea, on the nesting beaches and coastal habitats continued in all field projects. This information was disseminated to the authorities and local communities. New data collection activities were designed and novel monitoring techniques were implemented for sea turtles at sea, through satellite tags and the use of drones. More than 112.000 people received information about sea turtles during ARCHELON’s projects on nesting beaches. The information kiosks on Zakynthos, Crete and the Peloponnese were operated by the project volunteers. Guided tours were provided at the Rescue Center by volunteers throughout the year and a total of 6.700 visitors received information there. 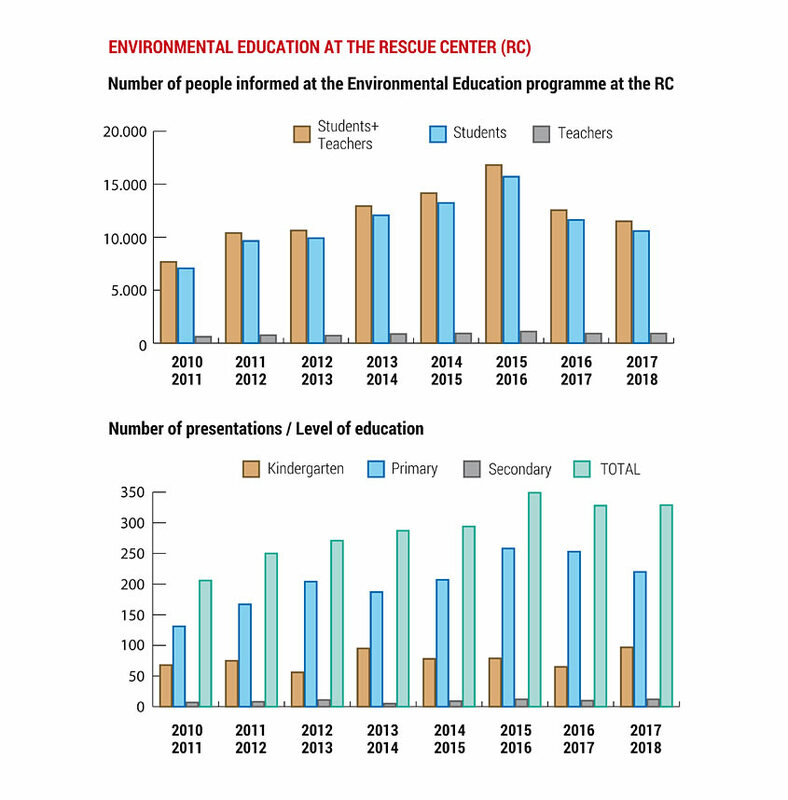 At the Rescue center more than 11.500 students with their teachers attended 329 presentations of the Environmental Education Program for Schools, during the 2017- 2018 school year. Our efforts to minimize disturbance at sea and effectively implement protection measures on the beaches were strengthened on Zakynthos, in collaboration with the National Marine Park and local businesses that comply with the regulations. We welcomed the State designation of Kyparissiakos bay as a Nature Protection Area and continued our efforts for enforcement of protection measures. Together with other environmental organisations, ARCHELON filed legal complaints against illegal and unauthorized actions both on Zakynthos and at Kyparissia. We worked together with the Region of Crete, the Environmental authorities and the tourist sector to achieve better implementation of management measures in the nesting beaches of Crete. Information was targeted to the public and the authorities around the nesting beaches of Lakonikos and Koroni, in order to enhance the implementation of existing protection measures. Our efforts for communication and collaboration with local groups and fishermen for the protection of nests and sea turtle rescue in other areas were intensified. We organized 5 Sea turtle Rescue Workshops with the participation of the Coastal Guards and fishermen, where the use of the Cutter – a tool for safely releasing sea turtles from nets, was demonstrated. Beach cleaning parties and a specific communication campaign for less plastic at sea were organized with ARCHELON volunteers in all project areas.